Summerhill Pools | Pool Excavation - We Bring The Right Equipment To The Job! Home » Blog » Excavating The Earth with a Large CAT 336 F L Straight Boom! 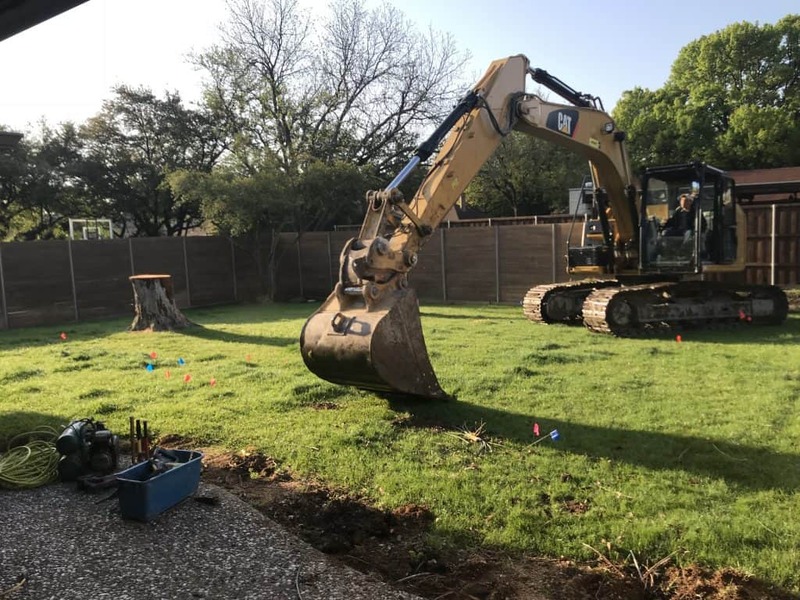 We are beginning the excavation phase of a new project in Dallas, TX. The Collins job is now underway and we are officially breaking ground on another beautiful swimming pool. First step in all new swimming pools is Excavation. Ah, what more could a pool builder want than mounds and mounds of dirt to play with? Nothing! In fact, the excavation is the very first step in every new construction project. It’s also one of the most important stages. It makes sense, really. Remove the dirt in the shape of your pool and fill it in with the good stuff. Sounds simple, right? Well, it’s a bit more complex than that. Let’s dive in together to see all the ways that Pool Excavation is important for you and your backyard! This is the CAT 336F L Excavator with a Straight Boom. It’s a heavy duty rig capable of displacing 563 Cubic Feet of dirt in a single scoop. Packed with 313 HP from the engine – this baby is ready to roll and get dirty! With any new pool construction, it’s important to stick to a plan. We spend hours and hours drafting up 3D Renderings, providing our customers with layout options and designing new & creative ideas. Minds are racked, designs are drawn up and your given a plan for a distinctive pool that you’re bound to be proud of! It’s an exciting time for any soon-to-be pool owner. So what’s next? Before we fill your gorgeous Summerhill Pool with water we’ve got to build it. To accomplish this task, we stick to a very strict set of guidelines, known as construction plans. As we previously mentioned, we stick to a very structured design. 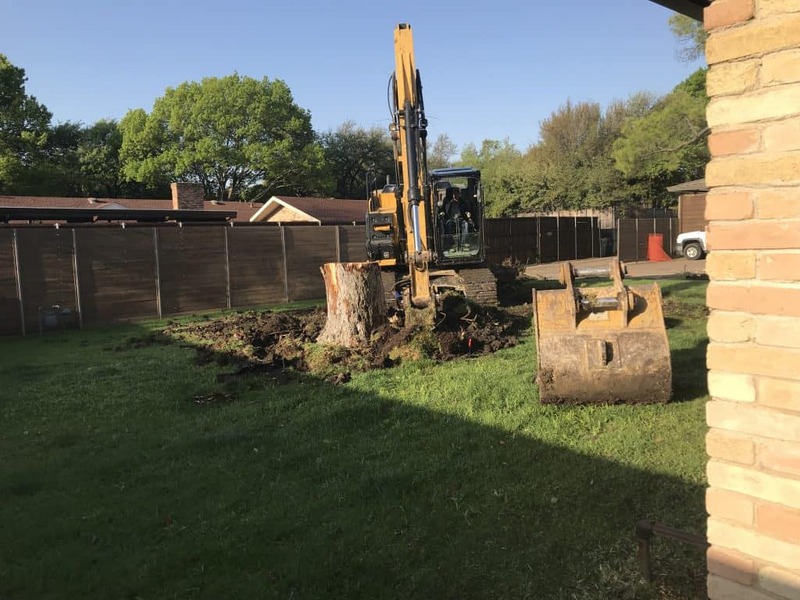 Prior to our excavation, we outline our pool with spray paint, constantly check our depths & add or remove dirt to achieve our desired internal layout. At Summerhill Pools, we take the additional time during our excavation stage to set ourselves up for success throughout the rest of the project. From the moment that we break ground, our superintendent is on site. We work collaboratively with our excavation teams to ensure that we stick diligently to our exact designs. In order to ensure we complete this project without a hick-up, we oversize our excavation rig. We’d rather have larger tools for the job so that there are no surprises along the way! If we had tried to save on cost and rent a smaller machine, we would have been in trouble on the Collins job! As you can see from the images above and below, we came across a foe of the pool industry. Tree stumps! Yikes! These ugly remains of chopped down trees can become the bane of our existence if not handled properly. 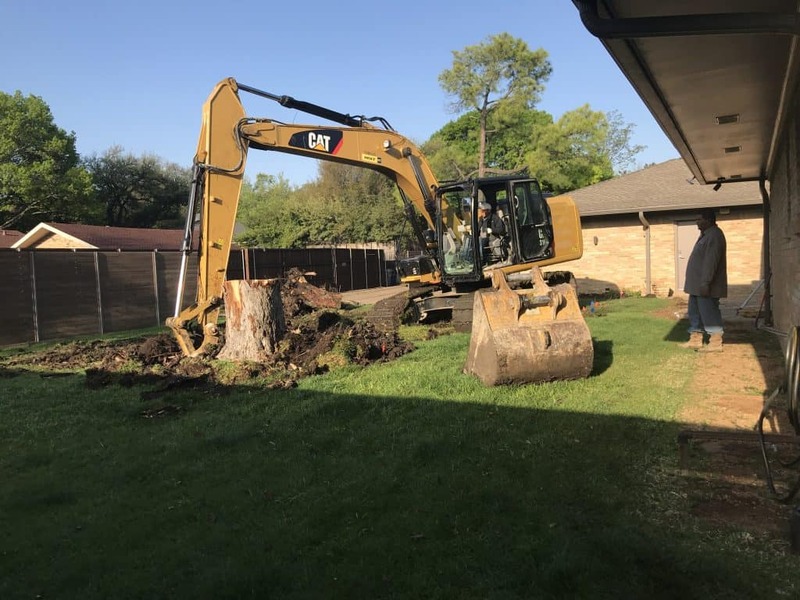 Tree roots run deep, crisscross in all directions and can cut into our plumbing and electrical lines. The best course of action on any remaining tree stump is to remove the entity all together. 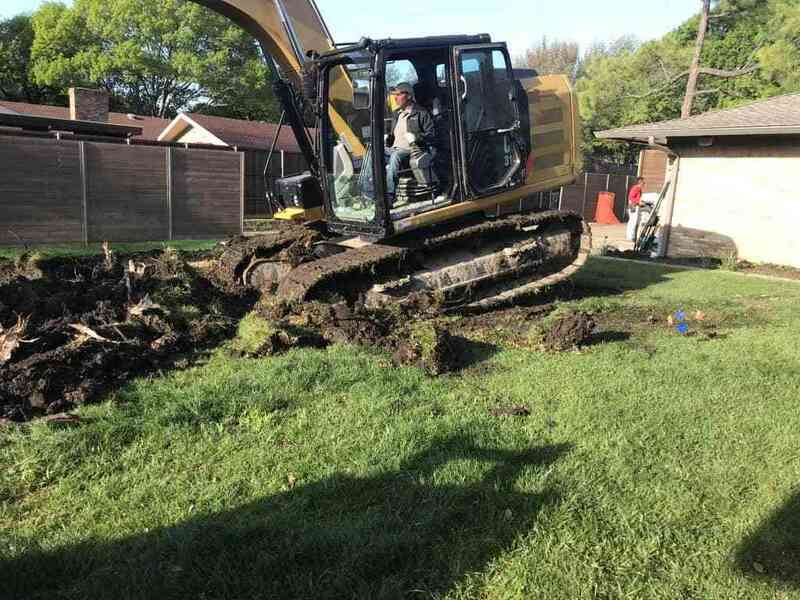 With our CAT 336 F L Straight Boom Excavator, this was child’s play! Our excavators have interchangeable lift mechanisms that can be added or removed. We change these mechanisms depending on the task at hand. In this instance, we switched our large drum for a smaller more precise unit to work around this large tree stump. We take the time necessary to accurately work around our job sites and ensure well executed work every time! We love working with vendors that supply with us heavy duty equipment. After all, it’s one of our favorite parts of the job. Getting in the big rig, working hard and focusing on the details. It’s what separates us from most other swimming pool builders. At Summerhill Pools, we are present during every stage of your construction project. We don’t skip steps and trust our sub-contractors to get the job done for us. It’s not our way of doing business and it never will be. We take our business of building long lasting swimming pools very seriously. The same can be said for the CAT 336 F L Straight Boom. This bad piece of equipment is capable of delivering 313 HP of Engine Capacity. Pair that with it’s maximum load of 89,900 lbs, swing torque of over 80,000 ft-lbf & maximum reach of 38 ft. This impressive machine was made to work! Our CAT Excavator made easy work out of this very large tree stump. Conveniently placed right in the middle of our excavation site, this abandoned tree stump had to go. 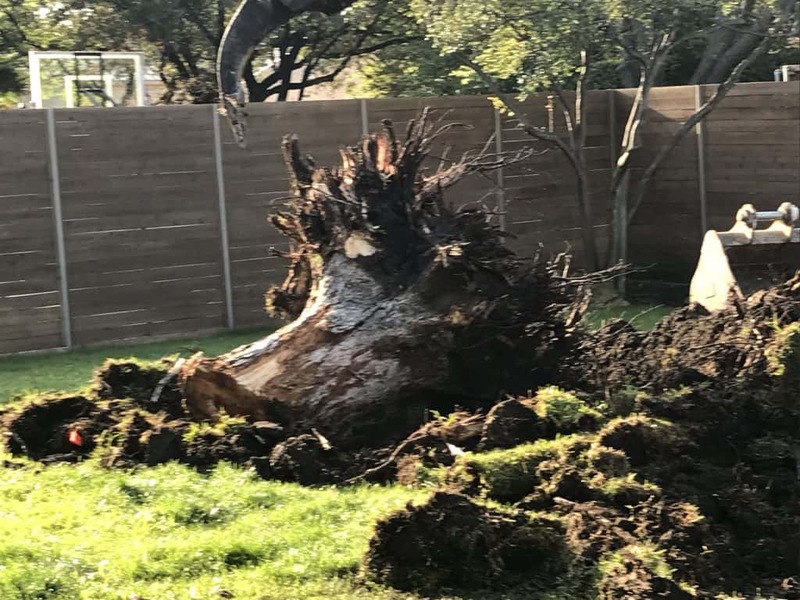 Not only are tree stumps a nuisance for a great looking back yard, but they also present a lot of hidden dangers. Tripping, critters, & damage to pipes – these old trees need to go. Summerhill Pools Digs Them Right! Once our excavation is complete, we have a “upward” building process. From running plumbing, tying steel, shooting gunite, spreading plaster & fill up – we are working from our empty hole upwards! It’s a fun process that takes a lot of skill & knowledge to complete correctly. We’d like to take a moment to remind our readers that purchasing a Gunite Swimming Pool is considered a permanent structure in their backyard. Not only do these structures consist of rugged materials – but they are also very costly to repair or replace. That’s why we believe wholeheartedly in inviting our customers to do their research! We like to think of ourselves as an open book for our customers to get to know, trust and love. It’s our way of doing business. We have nothing to hide in our business procedures. Our work is our history in the making. We strive for satisfied customers who are happy with our finished products. It’s how we separate ourselves from the competition and make the real difference for our customers!